Image: The Nelson-Atkins Museum of Art. In a discovery that makes Vincent Van Gogh suddenly strangely relatable, a conservator has spotted a dead bug stuck in one of his paintings. Specifically, a grasshopper, permanently mired in art. It was spotted by paintings conservator Mary Schafer. She told a local broadcasterthat she found it in the work’s lower foreground. “Looking at the painting with the microscope ... I came across the teeny-tiny body of a grasshopper submerged in the paint, so it occurred in the wet paint back in 1889. “What’s really fun about this is that we can connect it to Van Gogh painting outside, so we think of him battling the elements, dealing with the wind, the bugs, and then he’s got this wet canvas that he’s got to traipse back to his studio through the fields. 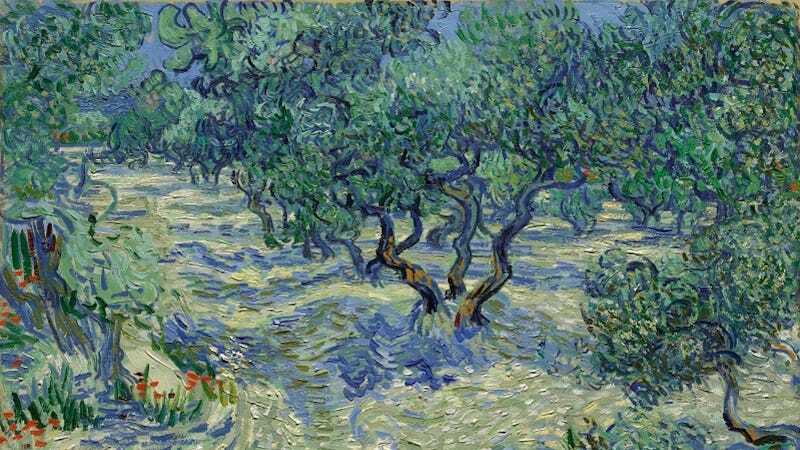 “Van Gogh worked outside in the elements, and we know that he, like other plein air artists, dealt with wind and dust, grass and trees, and flies and grasshoppers,” Juliàn Zugazagoitia, director of the Nelson-Atkins, told the Guardian. There is something very entertaining about the idea of every very serious artist who ever worked en plein air irritatedly waving away bugs and trying to keep the wind from blowing off their hats.